My warm water success so far this year has definately followed the K.I.S.S. method – Keep It Simple Stupid. Walt’s Worm has out produced my traditional favorite, the Gold Ribbed Hares Ear, for bluegill. Tied with Arizona Synthetic Dubbing on an unweighted hook it’s about as simple as it gets. 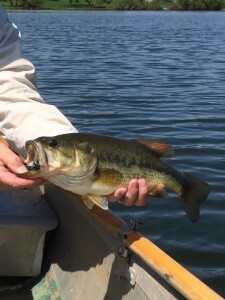 Largemouth bass have begun to be more active in my home waters and so far they seem to prefer an estaz worm. Both 3 and 6 inches have done well. The worm is simple, slim and lightly weighted. A tungsten bead is used for weight but there is no collar or tail added, just the estaz body. As you can see I like my warm water patterns to be very simple. I compare fly selection to deciding what to feed my nephews when they were little. Why feed them steak when they are just as happy eating hot dogs.